(PhysOrg.com) -- Writing in the journal Nature Physics, the academics, who discovered the world's thinnest material at The University of Manchester in 2004, have revealed more about its electronic properties. Research institutes and universities around the world are already looking at ways to build devices such as touch-screens, ultrafast transistors and photodetectors. Now the research from the creators of the material promises to accelerate that research, and potentially open up countless more electronic opportunities. The researchers, from the universities of Manchester, Madrid and Moscow, have studied in detail the effect of interactions between electrons on the electronic properties of graphene. They use extremely high-quality graphene devices which are prepared by suspending sheets of graphene in a vacuum. This way most of the unwanted scattering mechanisms for electrons in graphene could be eliminated, thus enhancing the effect of electron-on-electron interaction. 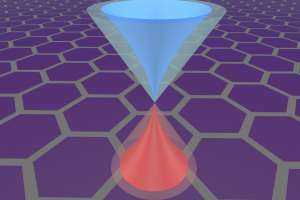 This is the first effect of its kind where the interactions between electrons in graphene could be clearly seen. The reason for such unique electronic properties is that electrons in this material are very different from those in any other metals. They mimic massless relativistic particles  such as photons. Due to such properties graphene is sometimes called 'CERN on a desk'  referencing the Large Hadron Collider in Switzerland. This is just one of the reasons why the electronic properties are particularly exciting and often bring surprises. Professor Geim and Professor Novoselov's pioneering work won them the Nobel Prize for Physics in 2010 for "groundbreaking experiments regarding the two-dimensional material graphene". The pair, who have worked together for more than a decade since Professor Novoselov was Professor Geim's PHD student, used to devote every Friday evening to 'out of the box' experiments not directly linked to their main research topics. One Friday, they used Scotch tape to peel away layers of carbon from a piece of graphite, and were left with a single atom thick, two dimensional film of carbon  graphene. Graphene is a novel two-dimensional material which can be seen as a monolayer of carbon atoms arranged in a hexagonal lattice. It possesses a number of unique properties, such as extremely high electron and thermal conductivities due to very high velocities of electrons and high quality of the crystals, as well as mechanical strength. Professor Novoselov said: "Although the exciting physics which we have found in this particular experiment may have an immediate implementation in practical electronic devices, the further understanding of the electronic properties of this material will bring us a step closer to the development of graphene electronics." Professor Geim added: "The progress have been possible due to quantum leap in improvement of the sample quality which could be produced at The University of Manchester." More information: "Dirac cones reshaped by interaction effects in suspended graphene", by D. C. Elias, R. V. Gorbachev, A. S. Mayorov, S. V. Morozov, A. A. Zhukov, P. Blake, L. A. Ponomarenko, I. V. Grigorieva, K. S. Novoselov, F. Guinea and A. K. Geim, Nature Physics. 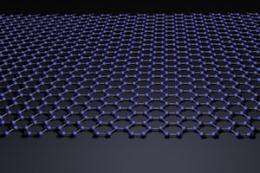 >> prepared by suspending sheets of graphene in a vacuum. >> the effect of electron-on-electron interaction. Very interesting for the quantum physicists, but it does not look practical for the semiconductor engineer.